OpenAire has dedicated itself to creating remarkable design solutions for clients around the world for over 25 years. Our team of architects, designers, and engineers, has created over 1,000 customized retractable skylights and enclosures, transforming ordinary spaces into unforgettable sunlit environments. Over the years, OpenAire's modern, sleek, lightweight, and precision-engineered solutions have provided year-round outdoor-style spaces and won praise not just from clients and their customers, but also from leading industry reviewers. OpenAire and its clients and partners have received many awards for excellence in interior design, engineering and more. Here are ten awards that our clients' facilities have just been awarded in the past few years. Recently, one of OpenAire's unique installations became part of an award-winning Royal Caribbean cruise liner. 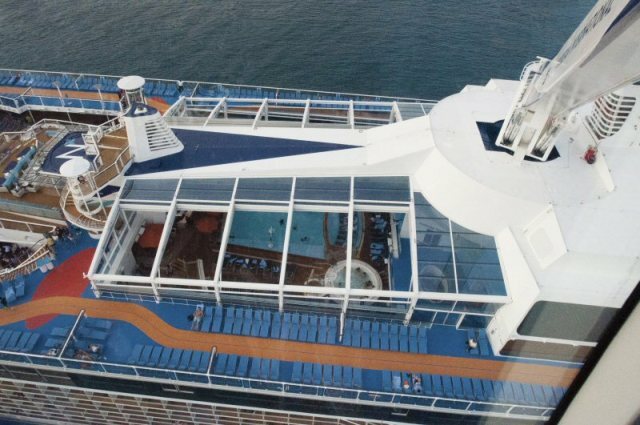 Royal Caribbean had chosen OpenAire to design attractive retractable enclosures to shelter the upper-deck pools of its new Quantum-series cruise ships, adding an awe-inspiring feature to guests' experiences. The second liner to feature OpenAire's enclosure, Anthem of the Seas, was voted Cruise Hive magazine's Best New Cruise Ship of 2015 by a majority of readers. The enclosure's glass roof panels and sidewalls over the indoor pool now open widely to let in ocean breezes on warm days, yet close seamlessly in inclement or cooler weather. This adaptability, combined with innovative engineering to keep the structure steady even in turbulent waters, make OpenAire's enclosure a rock-solid addition to an award-winning ship. The Gusto 101 diner in Toronto's trendy Fashion District began its life as an abandoned industrial auto body shop. The restaurant's owners wanted to create a diner atmosphere that was retro yet innovative. OpenAire offered them just the right solution: a telescoping retractable skylight enclosure over the second-floor patio. This stylish modern design on the top of an old, repurposed building caught the attention of Hospitality Design (HD) Magazine, which "[honors] the achievements of superior design and architecture in spaces around the globe." HD's panel of industry experts chose Gusto 101 out of dozens of entries as the 2013 winner for Best Restaurant Design (Casual/Quick Service). It's a distinction that hundreds of satisfied guests agree with. In Europe, OpenAire helped Donetsk, Ukraine make its mark on the world stage in time for the 2012 European Football Championship, creating a colossal retractable aluminum dome to house the city's new Aqua Sferra Waterpark. With a diameter of 278 feet and a height of 86 feet (61,000 square feet in total), the Aqua Sferra dome holds the world record for largest free-standing, retractable aluminum dome. The remarkable facility has attracted long lines of visitors since opening, as well as attention from the trade magazine Aquatics International (AI). AI chose Aqua Sferra as a 2013 Dream Design winner, not just for its great array of slides and attractions, but also for the unique all-seasons environment created by the lattice-like dome. In 2015, Etobicoke, Ontario's landmark pool hall and restaurant The Crooked Cue was looking for a way to revitalize its location, especially its upper floor event area and patio space. OpenAire offered the solution they needed with a double-sloped, 960 square-foot skylight with retractable roof and side walls. The tailor-made enclosure lets The Crooked Cue use its second floor like a patio as well as an indoor entertainment area in any weather or season, creating an open-concept, outdoor-style design that guests have never seen before. "People are loving it and bringing their friends to see it," says Sam Pappas, owner of The Crooked Cue, "We were only closed for 6 weeks and the result was worth it. We had as many guests in the first week of July, upon opening, as we did the entire month of July last year." The newly reopened restaurant and pool hall also caught the attention of two major Canadian TV networks, TSN and the CBC, who each awarded The Crooked Cue a place on their lists of "Canada's Top Pool Halls" for its great atmosphere and entertainment. In New York City, filled with world-famous architecture, an OpenAire design gained three awards from different sources. The Refinery Hotel in New York's Garment District was built from a restored 1912 building. The ownership approached OpenAire to design a retractable enclosure for the hotel's new rooftop bar, one which would combine the existing Victorian style with a modern theme. The resulting outdoor-style space, which offers open views of the Empire State Building all year round, fits the hotel perfectly and has drawn rave reviews. The Refinery Hotel received a Restaurant & Bar Design Award in 2014, the SBID International Design Award for Hotel Design in 2015, and #1 ranking in the 10Best Readers' Choice Award for Best Hotel Rooftop Bar. Back in Toronto, OpenAire's work has led to three more awards for clients in the past year. In Toronto's Harbourfront District, OpenAire made a radiant addition to the spectacular new Ice Condominiums at York Centre. Our team designed, engineered, manufactured, and installed several custom-made circular skylights in the complex's 57 and 67 storey towers. The natural light let in by these skylights helped to make these elegant, attractive condos as cool as their name. The complex's design led to Ice's developers, Lanterra Developments and Cadillac Fairview, earning a Reader's Choice Award from Urban Toronto. Further from the downtown core, OpenAire added a brilliant new accent to one of the city's oldest and most prestigious country clubs, The Granite Club. The management of The Granite Club wanted an enclosure for its new pool and aquatic play area; one with a very minimal design that didn't seem to add to the existing building. OpenAire obliged with an unobtrusive glass lean-to enclosure whose roof can open almost 75% of its area, while half of the outside walls open 100% of the way. The result is a pool that seems almost to be completely outdoors in the summer, yet is also very open to the sky when the enclosure is shut in cold or inclement weather. This one-of-a-kind addition has become a popular part of the club's spectacular architecture. Following the renovation, The Granite Club earned the "Best of the Best" award from the Toronto Construction Association, as well as the prestigious Distinguished Emerald Club Award from Board Magazine. Judges for the Distinguished Emerald selected The Granite Club out of many country clubs worldwide for its distinctive, unforgettable atmosphere and member experience, made possible in part by its world-class facilities. Since our first project, OpenAire has been committed to exceeding expectations and delivering the very best solutions. Our customized enclosure designs are built to match our clients' unique specifications and needs, providing energy efficiency, durable engineering, maintenance-free materials and awe-inspiring architecture. The fact that our work has helped our clients earn prestigious awards from around the world is the greatest honour we could receive. We look forward to creating even more incredible results and improvements with our work, and we hope that our next award-winning project can be for you.